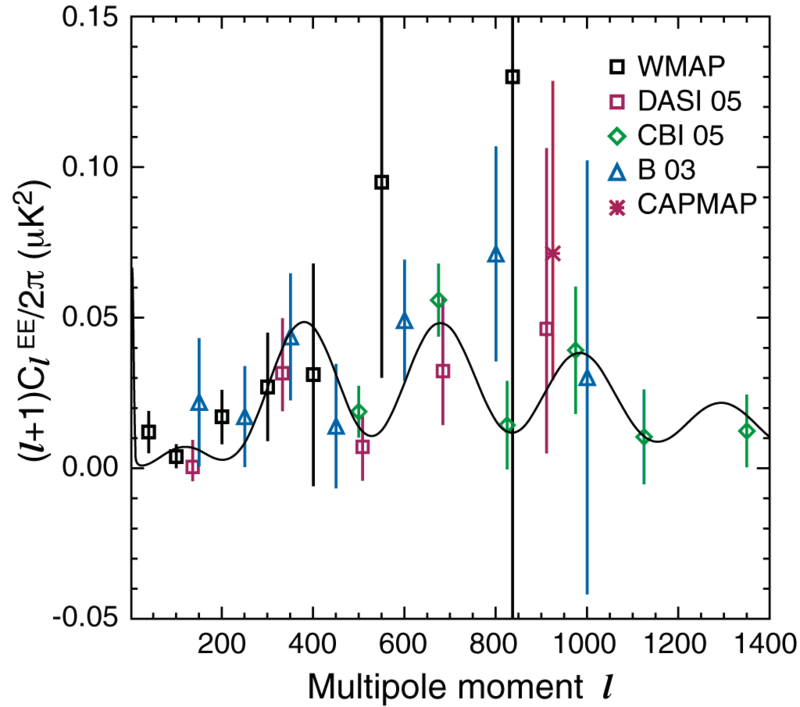 WMAP Three-year Paper Figures, Page et al. 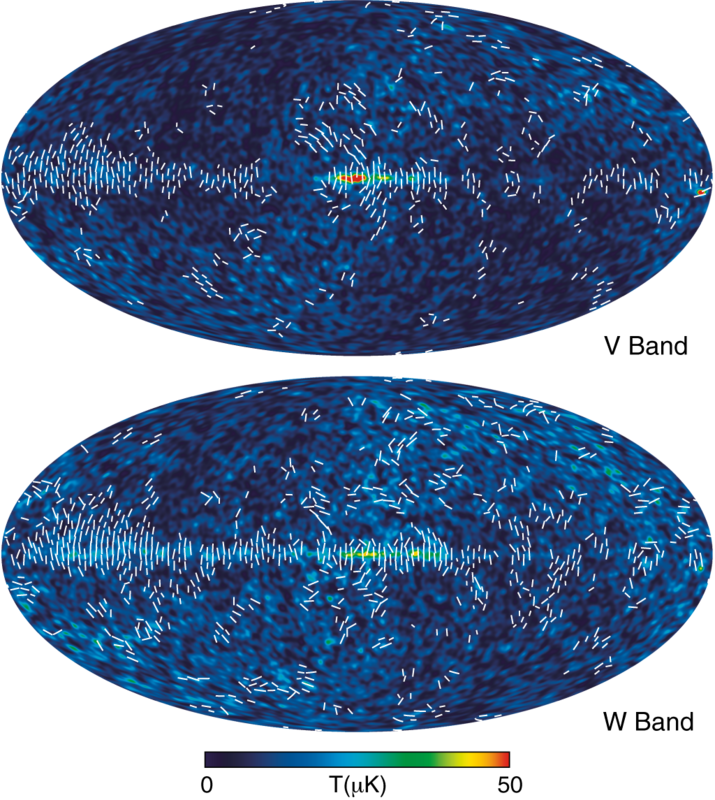 A model of the ionization history of the universe. 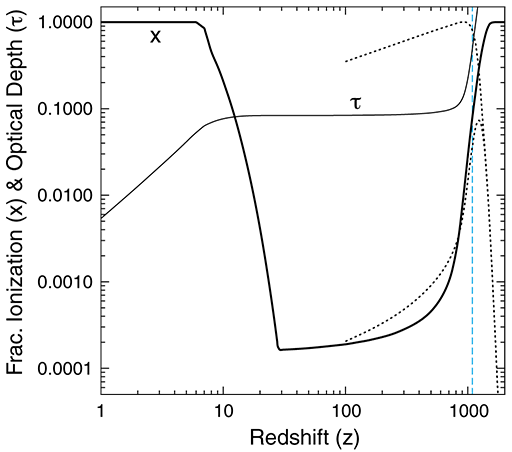 The line marked "x" is the ionization fraction, x=ne/n where ne is the number of electrons and n=11.2ωb(1+z)3 m-3 is the number of protons with ωb the baryon density. 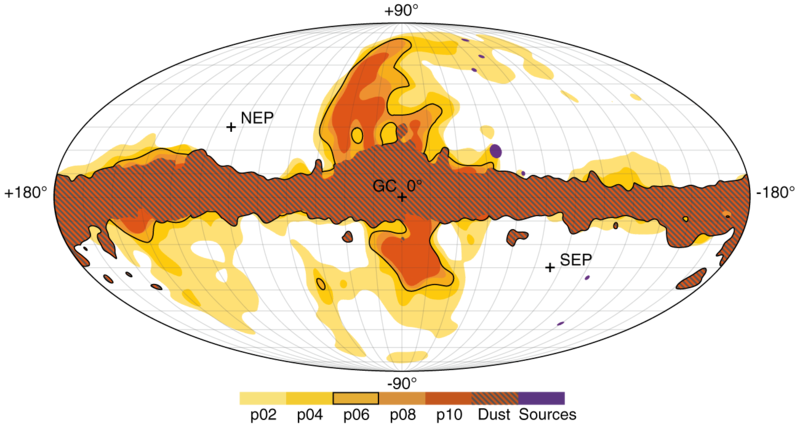 Top: Map of Tau A in Galactic coordinates at 41 GHz in Stokes I, Q, U, P, smoothed to 1o. 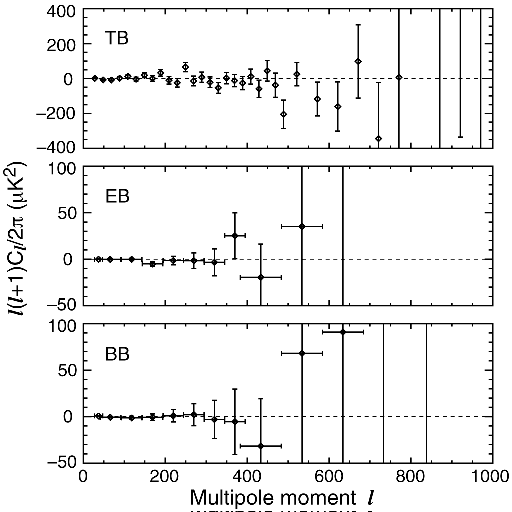 Since Tau A is polarized parallel to the Galactic plane it is negative in Q and small in U. 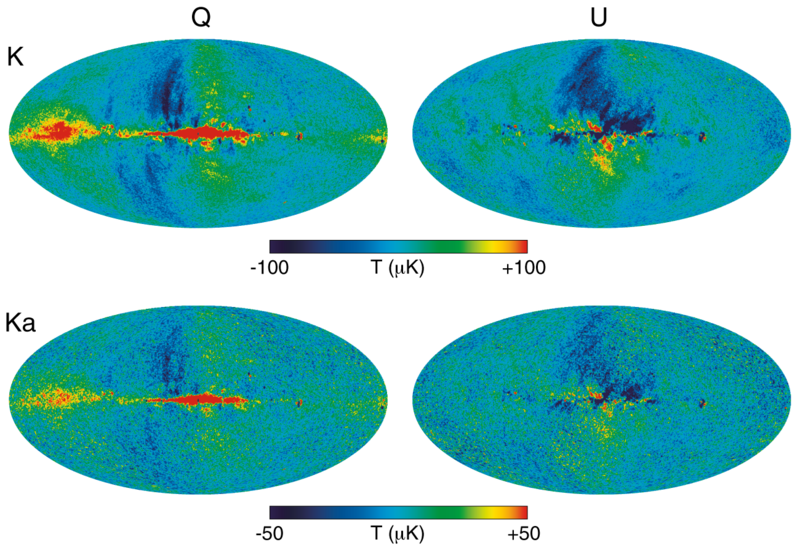 Bottom: Map of Centaurus A in Stokes I, Q, U, and P.
P and γ maps for K, Ka, and Q bands in Galactic coordinates. 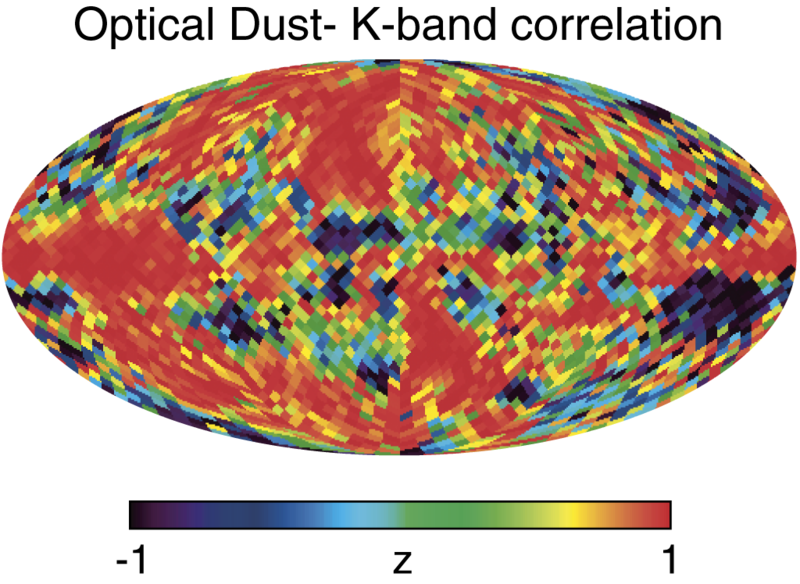 There is only one polarization map for K and Ka bands. For Q band, there are two maps which have been coadded. The maps are smoothed to 2o. Similar to Figure 3 but for V and W bands. The two V-band maps have been coadded as have the four W-band maps. The relatively higher noise in the ecliptic plane is evident. 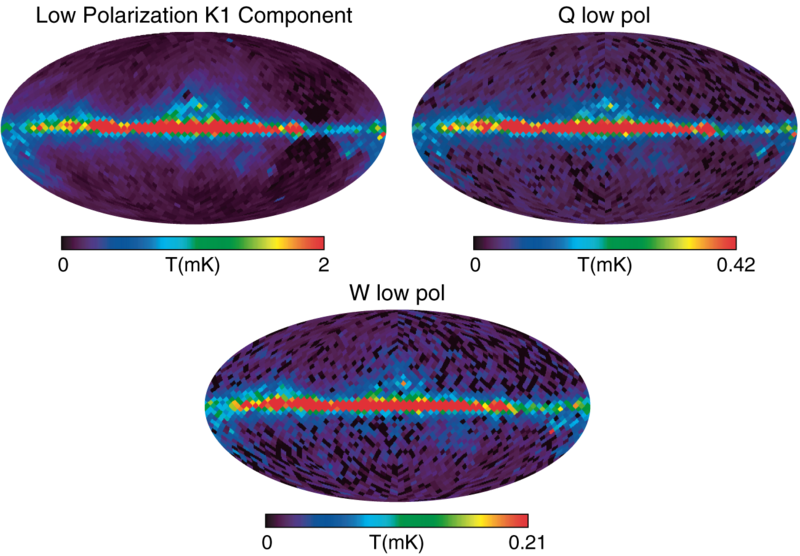 Maps of the noise bias have been subtracted in these images. 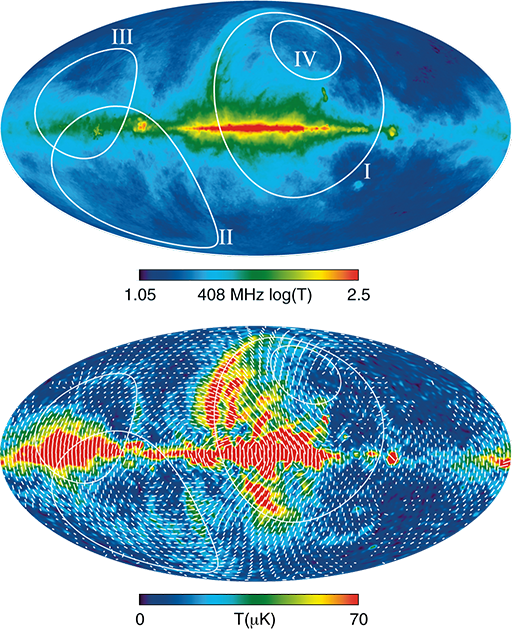 A Lambert azimuthal equal area projection of the Galactic poles (left: north) showing the K-band polarization. 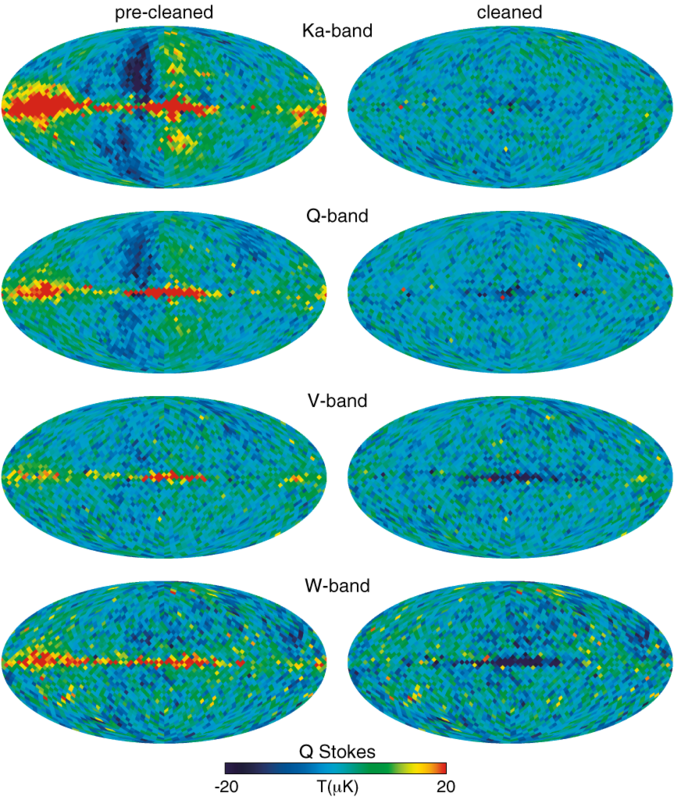 The circumference of each map is at zero Galactic latitude. 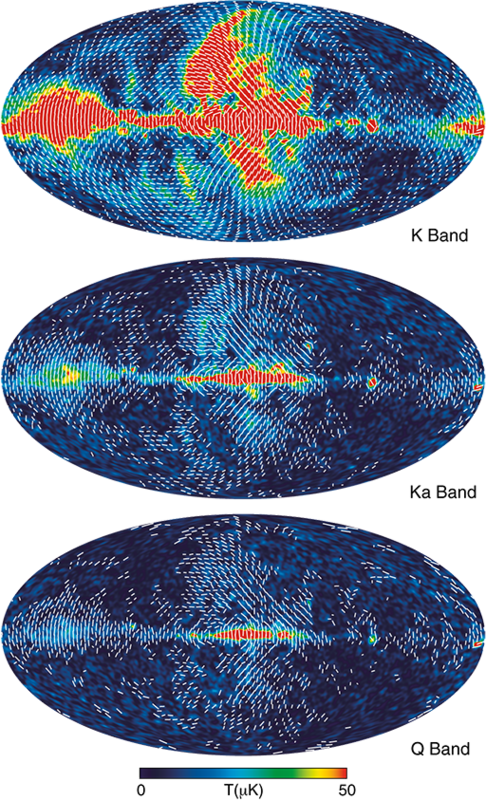 Stokes Q and U maps in K and Ka bands. 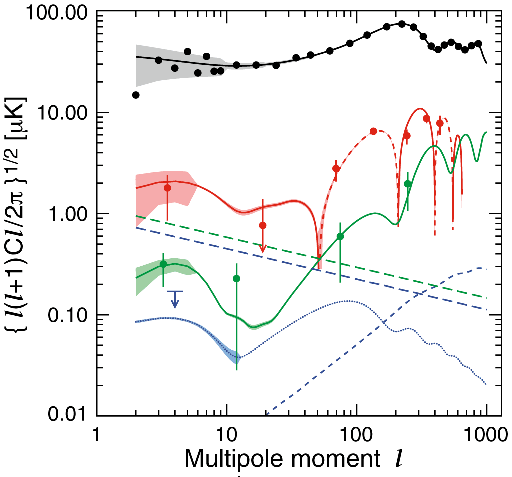 The Galactic plane is dominated by positive Stokes Q because the foreground polarization direction is perpendicular to the plane. 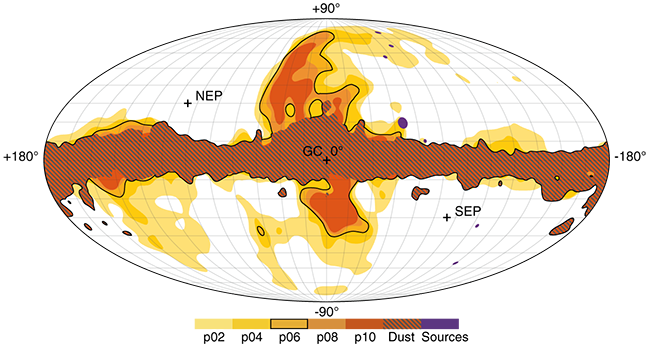 As discussed in §4, this is expected because the Galactic magnetic field is predominantly parallel to the plane. 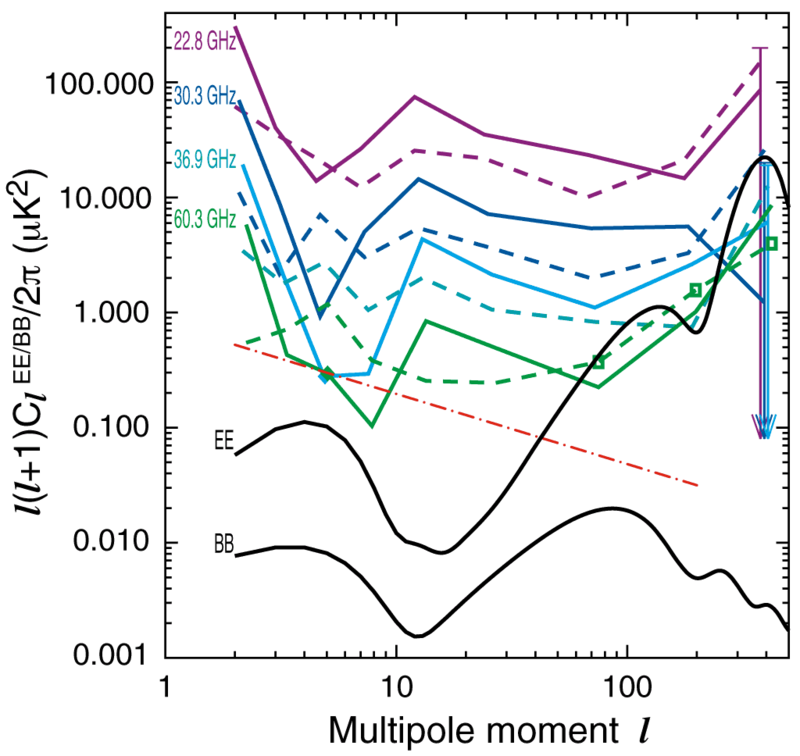 Left: The angle of the magnetic field, γM=γPA+90o, derived from the synchrotron radiation in the K-band map. Right: The predicted magnetic field direction given by a simple model of the electron distribution and the logarithmic spiral arm model. 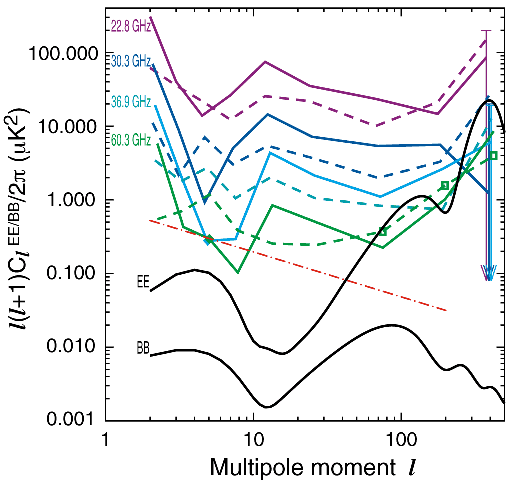 The left panel shows the geometric suppression factor, gsync, in the polarization due to the magnetic field geometry. 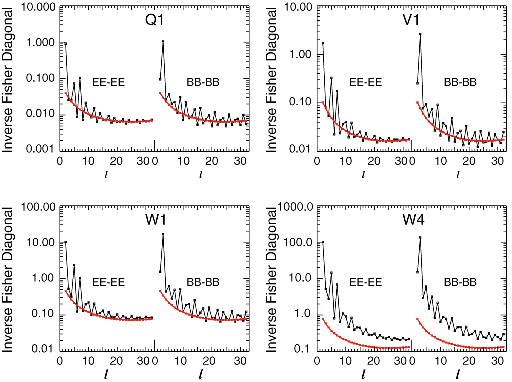 The right panel shows a similar geometric suppression factor for polarized dust emission. 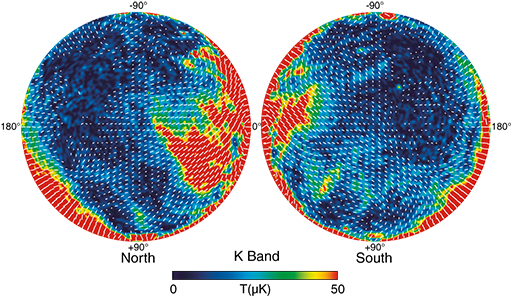 Left: The observed K-band polarization, P. The color scale ranges from 0 to 0.1 mK. 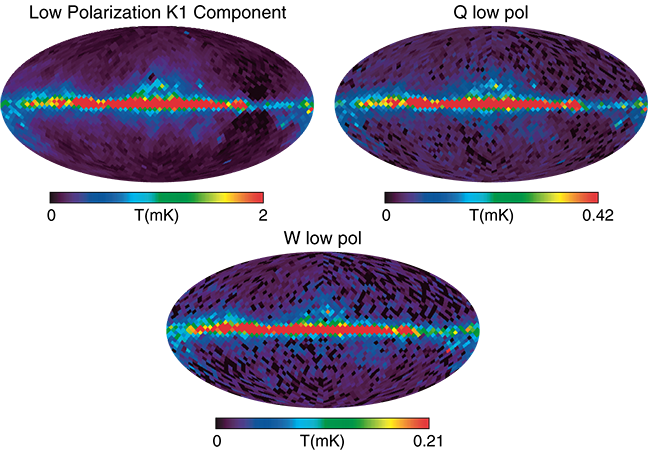 Right: The model prediction of the K-band polarization based on the Haslam intensity map. 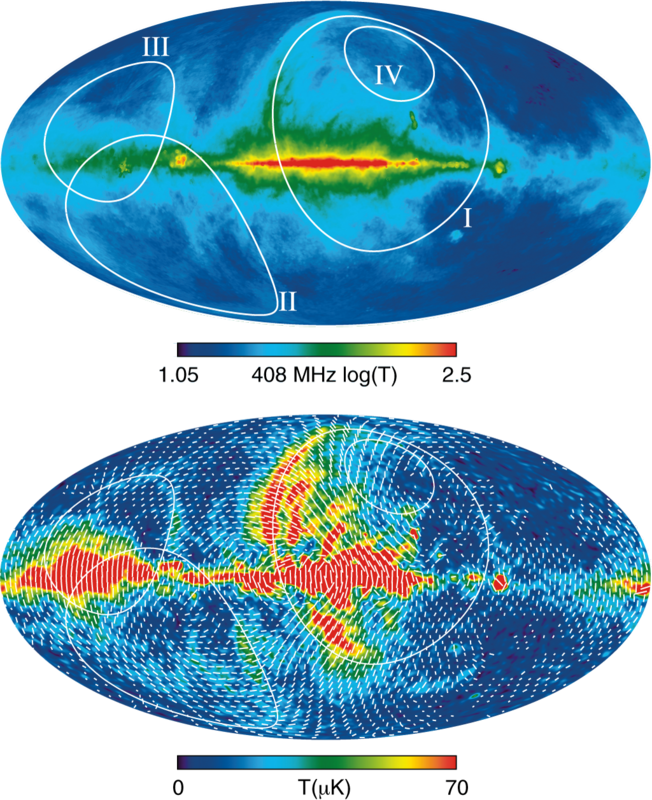 Top: The Haslam 408 MHz map is shown with circles indicating loops from Berkhuijsen et al. (1971). 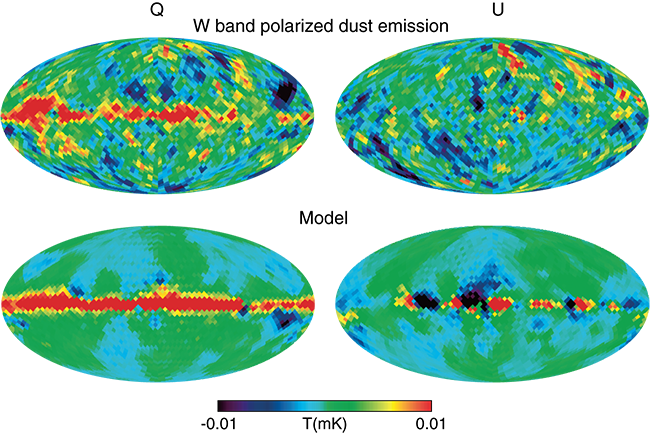 Bottom: The WMAP K-band polarization map with the same loops superimposed. (1971). 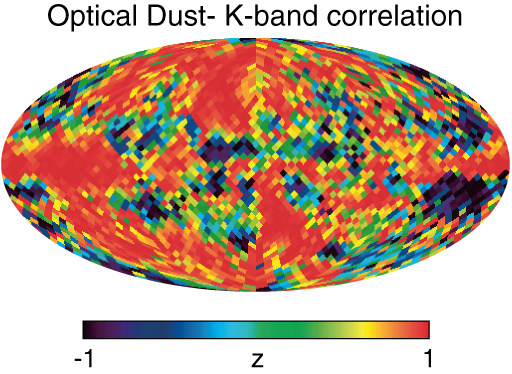 A map of the correlation, Z, between the polarization angle derived from the polarization of starlight, and the polarization angle in K-band. 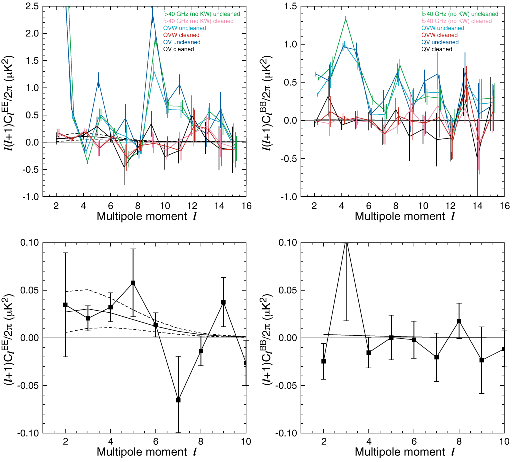 In the regions of high Kband polarization, the correlation is strong. 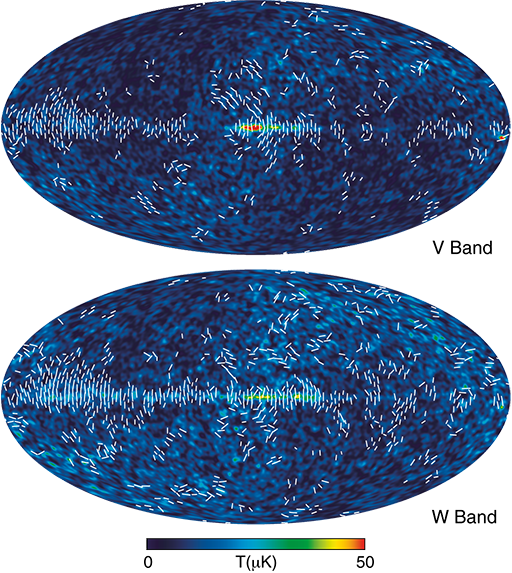 The upper panels show the polarization signal at W band with the CMB and synchrotron signal removed (smoothed with a 10o Gaussian beam). 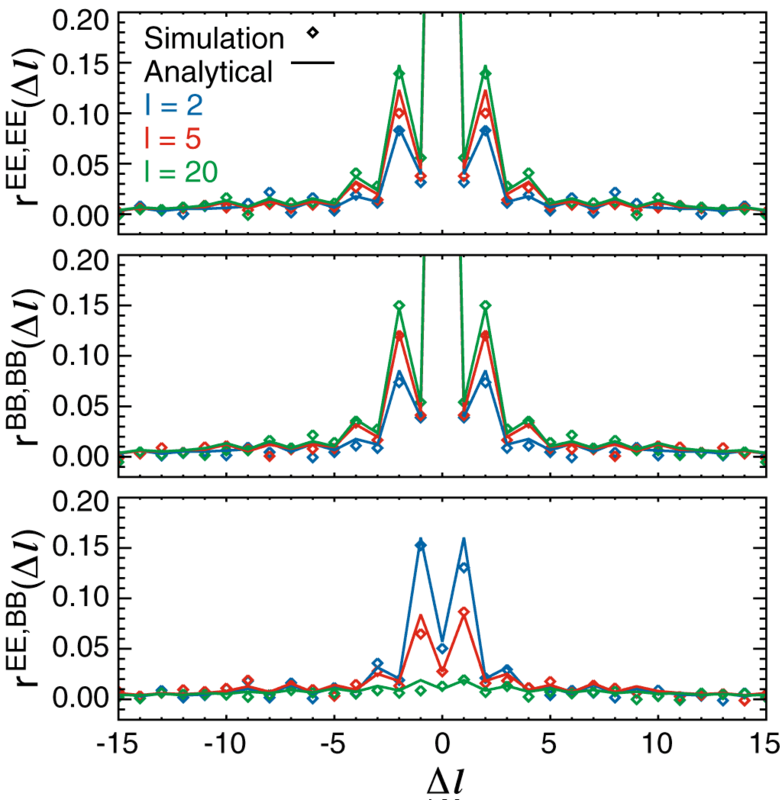 The lower panels show the predicted dust polarization based on Equation 15. 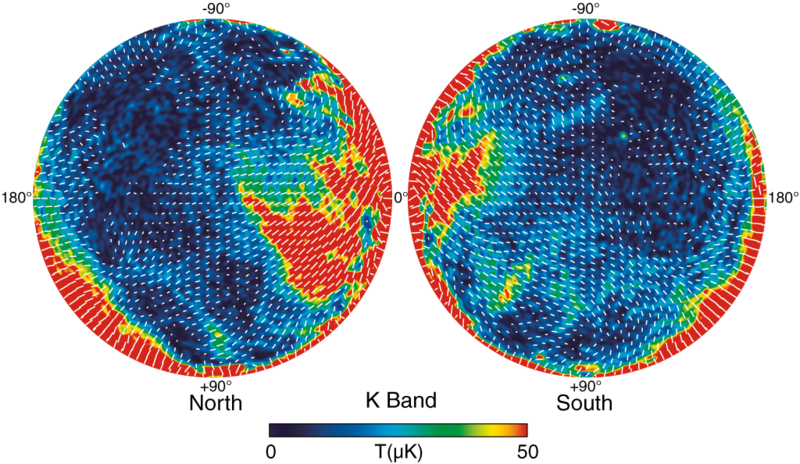 Temperature maps of the low polarization components for K, Q, and W bands. The maps are computed using equation (16). The color scale is in mK. 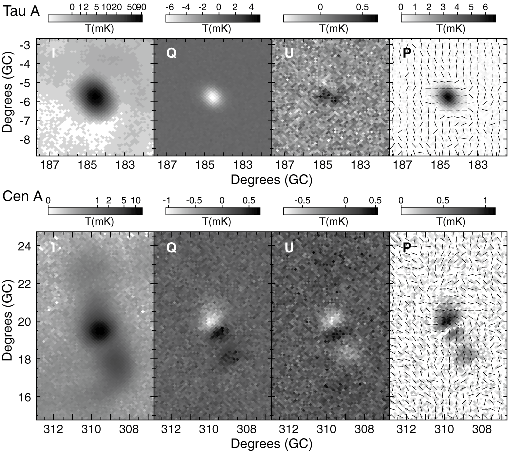 Near the Galactic center, the low polarization component is approximately 6%, 3%, and 6% of the unpolarized emission in K, Q, and W bands respectively. The polarization masks, in Galactic coordinates, are shown for the P02, P04, P06, and P10 cut levels. 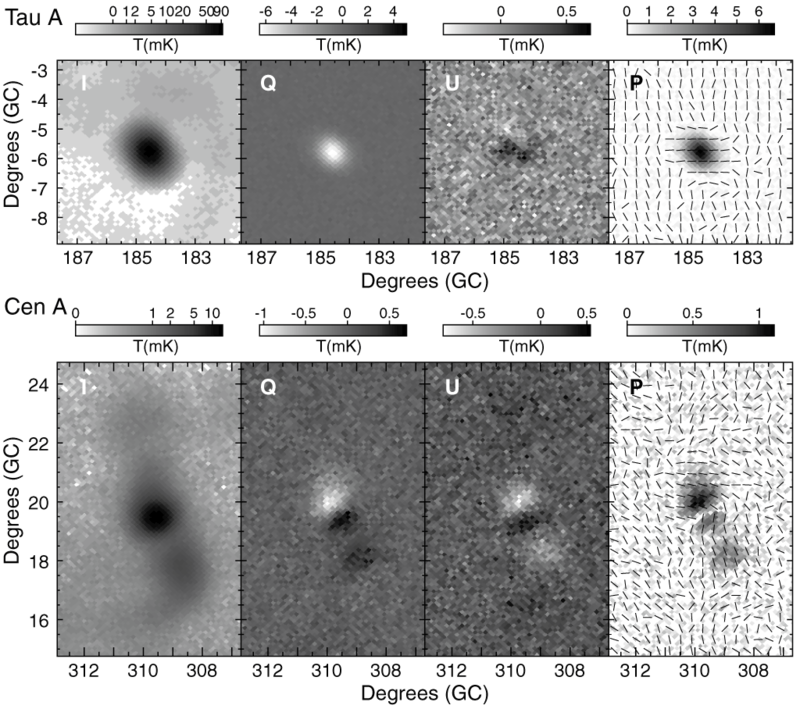 The cross hatched region along the Galactic plane, common to all polarization masks, shows the dust intensity cut. 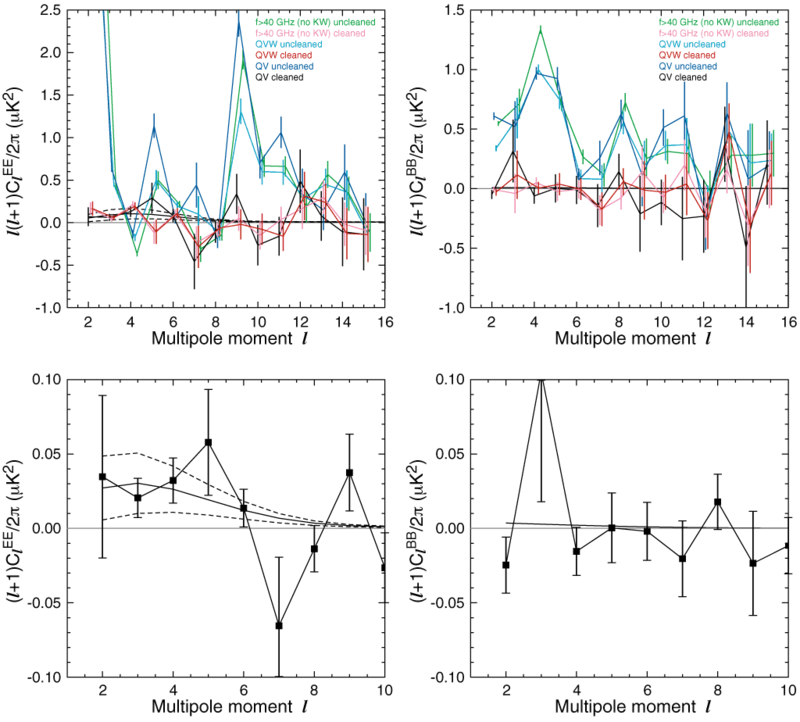 The Ka, Q, V, and W band Q Stokes Parameter maps before and after foreground subtraction using the method outlined in §4.3. There is a possible residual signal in W band though the noise is not yet sufficiently low to be certain. 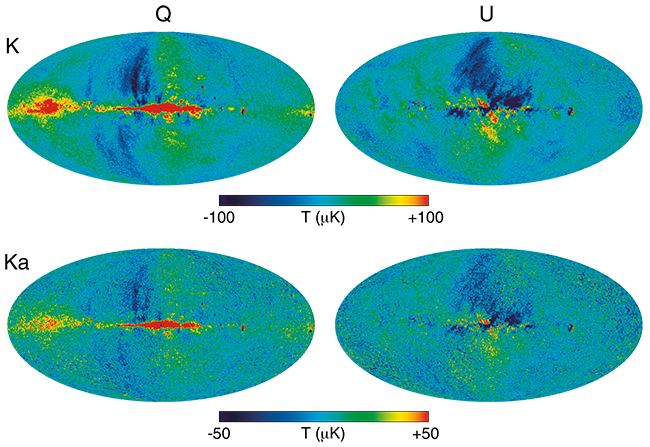 A comparison of the predicted Cl errors with (black) and without (red) assuming correlated noise in the polarization sky maps. On the y-axis is plotted the diagonal element of the inverse of the Fisher matrix for one year of data. 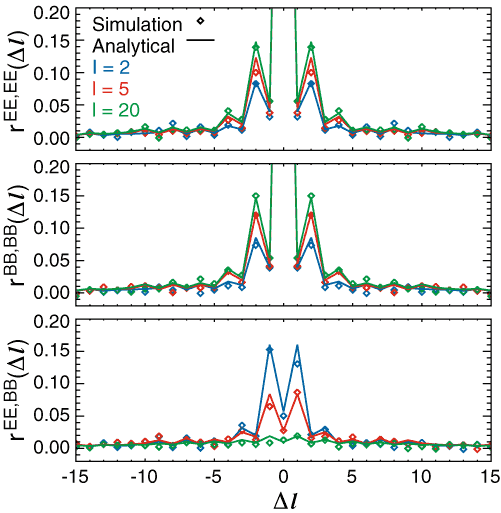 The absolute value of the EE (solid, violet through green) and BB (dashed, violet through green) polarization spectra for the region outside the P06 mask. 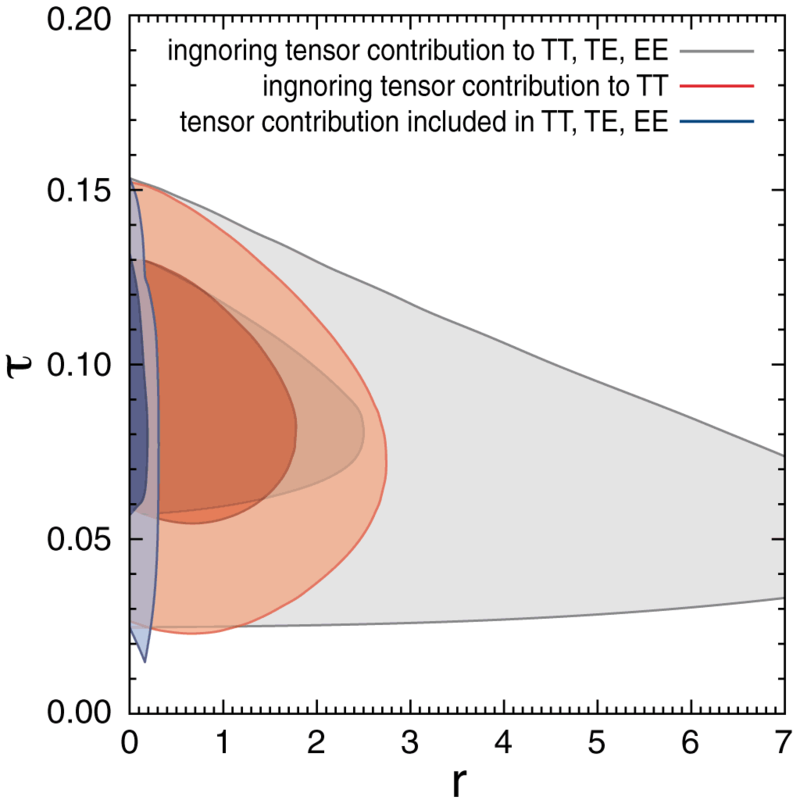 The best fit ΛCDM model to TT, TE, and EE data with τ=0.09 and an additional tensor contribution with Γ=0.3 is shown in black. 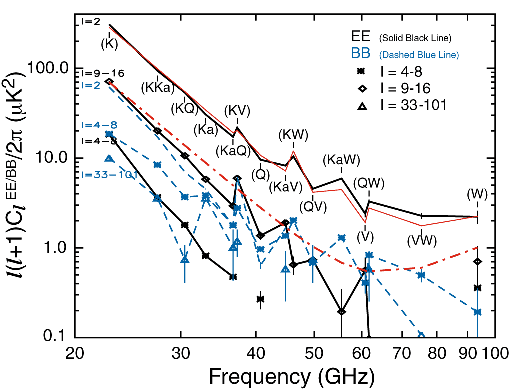 The frequency spectrum of the EE and BB power spectra for the region outside the P06 mask. To increase the signal to noise ratio, multiple values of l are averaged as indicated. Only statistical errors are shown. Negative values are not plotted. 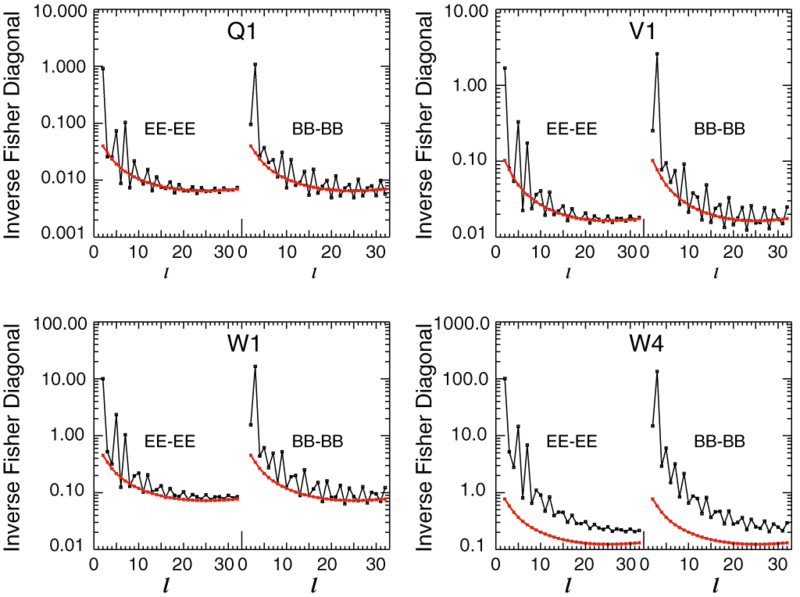 The frequency spectrum of the foreground cleaned EE and BB power spectra outside the P06 mask for l=2-9. Black shows EE, blue shows BB, and green, cyan, and orange show the EE yi-yj spectra (the BB ones are similar). The TB, EB, BB spectra for the region outside the P06 mask. 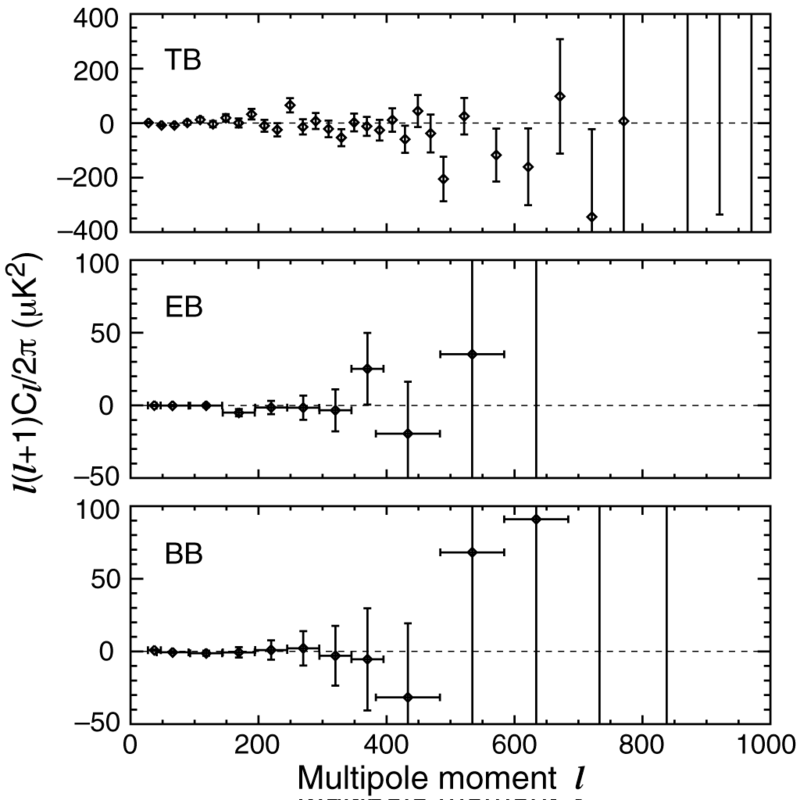 These spectra are expected to be null. For T, the foreground-cleaned V and W bands have been combined. For E and B, the foreground-cleaned Q and V bands have been combined. 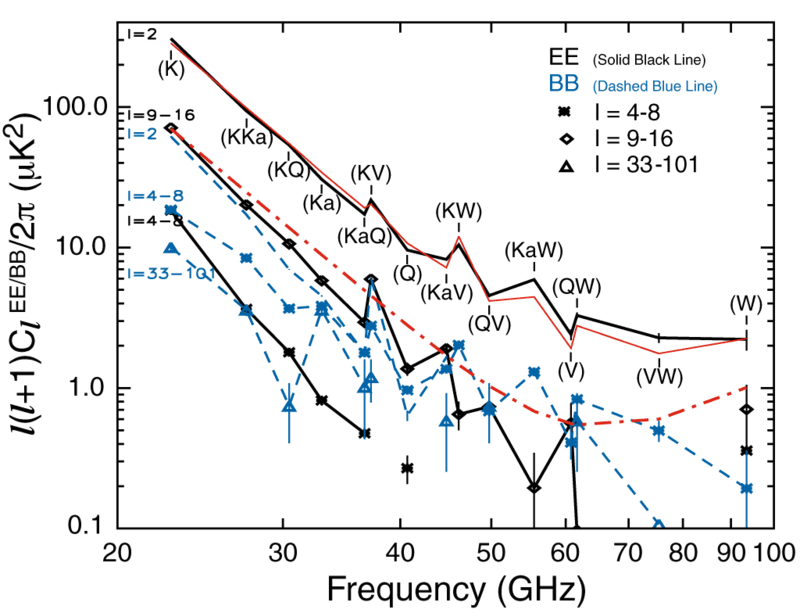 Top: The EE and BB power spectra outside the P06 mask before and after applying the KD3Pol foreground model. 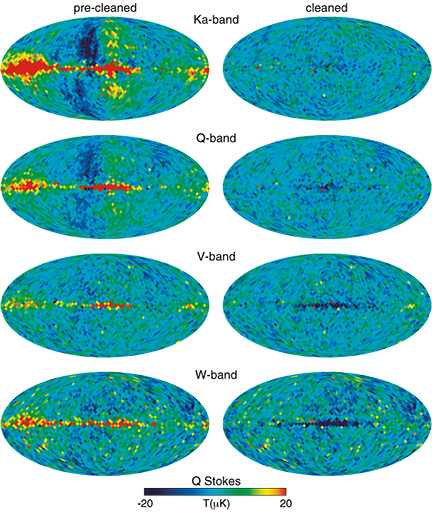 Bottom: Expanded plots of the QV data for the P06 cut. 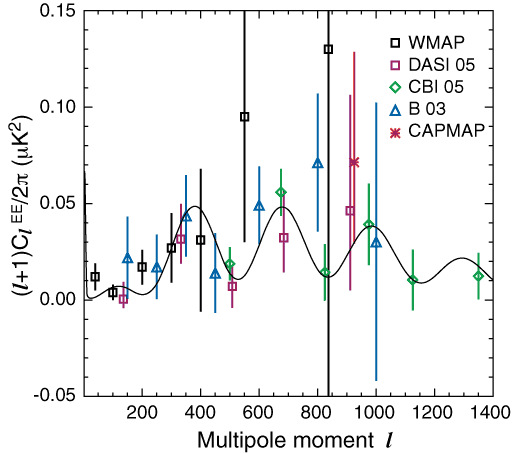 The EE spectrum at l > 40 for all measurements of the CMB polarization. The curve is the best fit EE spectrum. Note that the y axis has only one power of l. The black boxes are the WMAP data; the triangles are the BOOMERanG data; the squares are the DASI data; the diamonds are the CBI data; and the asterisk is the CAPMAP data. Left: Lines of ΔΧ2 for the fit given in Equation 28 vs. AEE. The different colors correspond to different frequency combinations. 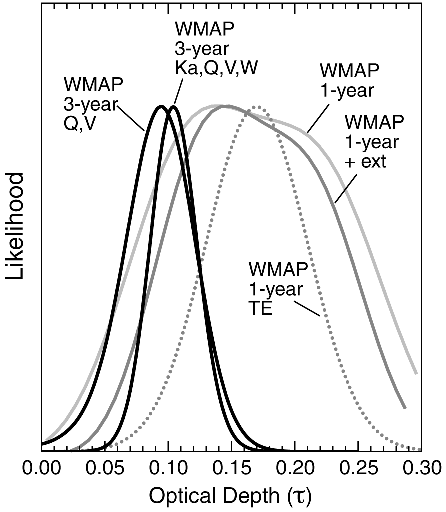 Right: The amplitude and phase of the TE measurement with respect to the model predicted by the TT data. 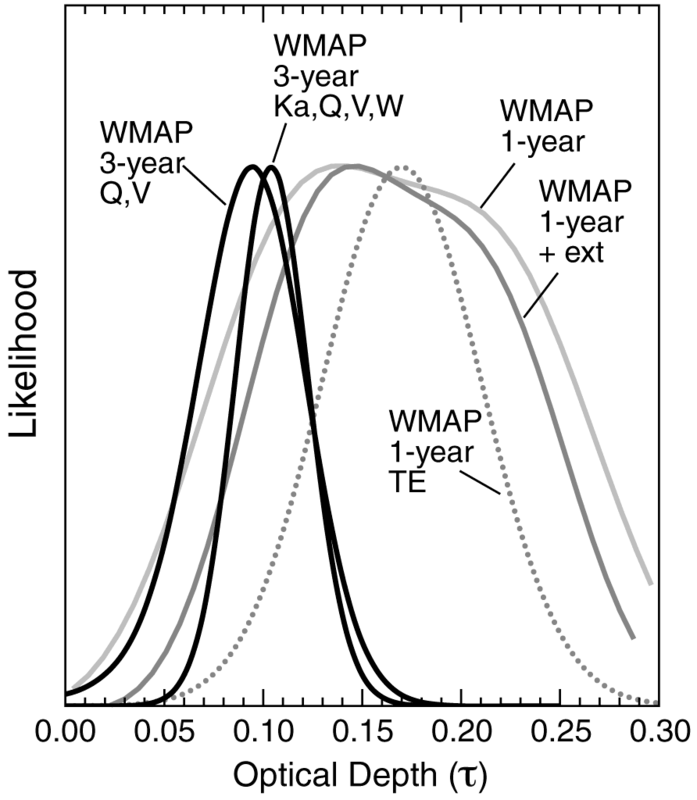 The TE power spectra for high and low l ranges for the region outside the P06 mask in EE and TT. 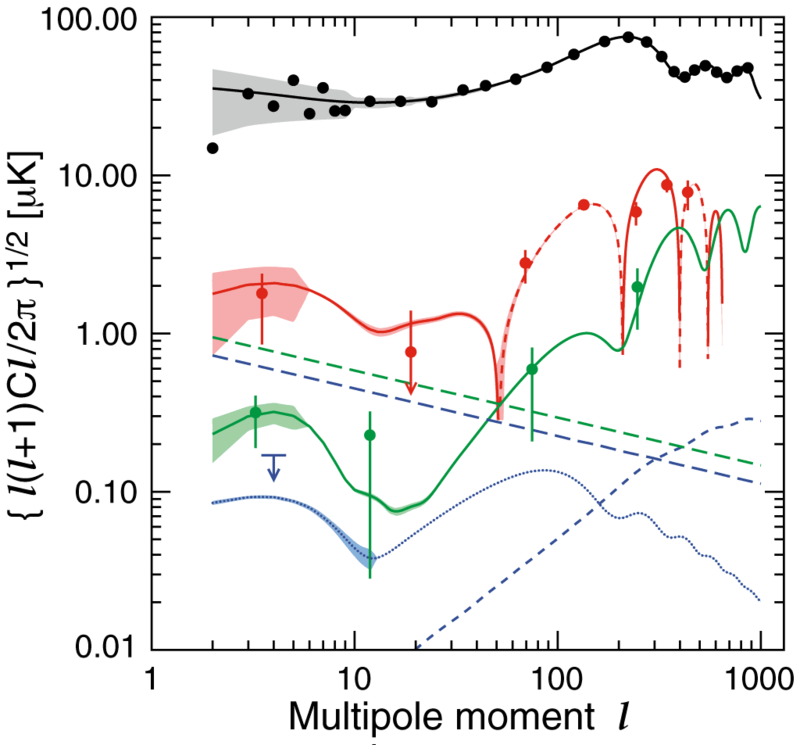 Plots of signal for TT (black), TE (red), EE (green) for the best fit model. The dashed line for TE indicates areas of anticorrelation. 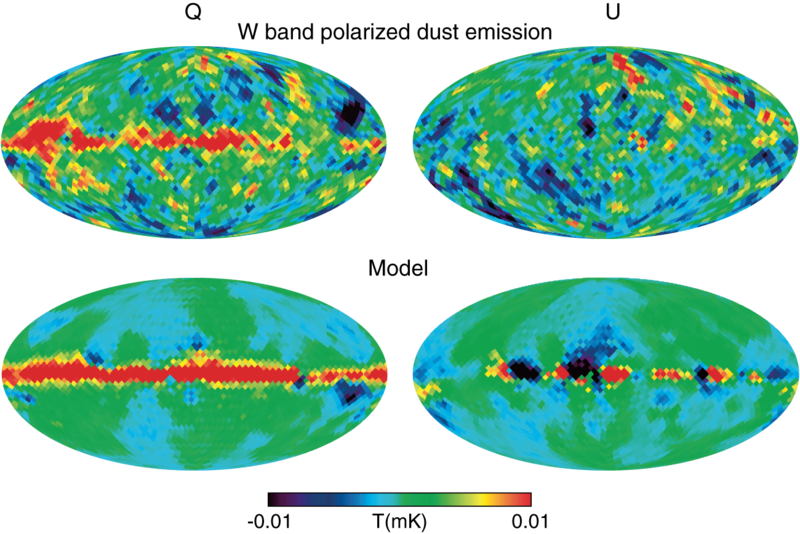 The cosmic variance is shown as a light swath around each model. The relative likelihoods of τ from the stand alone exact likelihood code and the first-year analysis. 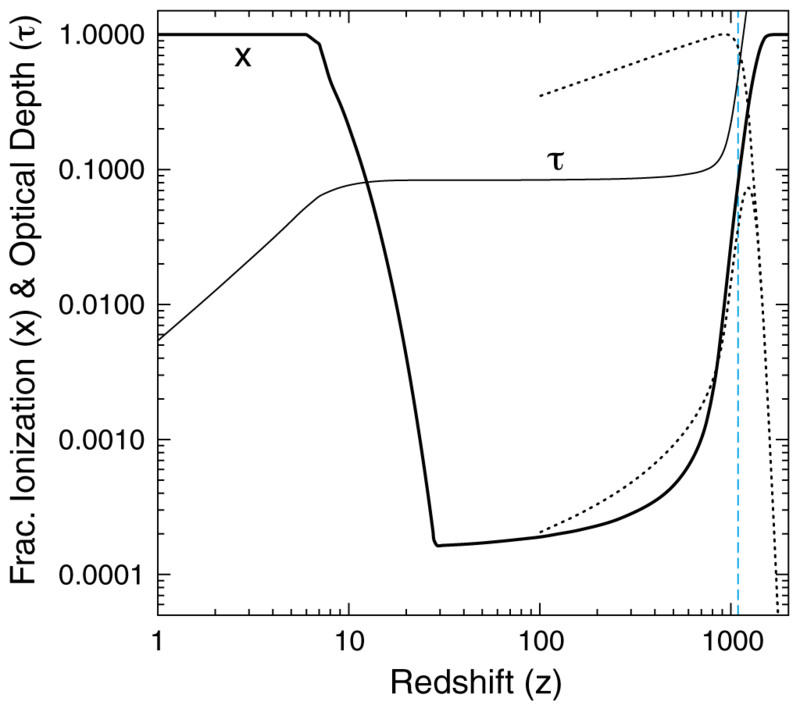 For the three-year results, all parameters except τ and the scalar normalization, A, were held fixed as described in the text. The two dimensional likelihood as a function of Τ and Γ for the BB spectrum. The contours indicate 1σ and 2σ. The ns parameter, which is degenerate with Τ and Γ, has been set at ns = 0.96. The correlation coefficients of the Fisher matrices. The diamonds are derived from 100,000 Monte Carlo simulations, while the solid lines are the analytical formulae in the noise-dominated regime.